This assessment measures you across 9 archetypal Strengths Roles, and determines your top two. These are the roles which reflect your natural strengths, and if pursued, will give you a natural advantage in your career. You are a catalyst. Your power lies in your craving to bring two people or ideas together to make something bigger and better than it is now. You make sense of the world–pulling it apart, seeing a better configuration, and creating it. You are a levelheaded person whose power comes from keeping the world in balance, ethically and practically. You engage people directly and persuade them to act. Your power is your persuasion. You see the world as a friendly place where around every corner good things will happen. Your power comes from your optimism in the face of uncertainty. You sense other people’s feelings, and you feel compelled to recognize those feelings, give them a voice, and act on them. You are the host of other people’s emotions. You feel responsible for them, for turning them around, for elevating them. You are thrilled by the potential you see in each person. Your power comes from learning how to unleash it. The way the strengths assessment works is that you are presented with a slightly stressful stimulation and a set of choices. You then have 45 seconds to make your choice. The time limit helps ensure that your answers reflect your instincts, and the choices are filled with trigger words that appeal to specific strengths roles. The result is complete strengths profile that doesn’t depend on self-assessment, and isn’t vulnerable to being gamed. For me at least, the results were not what I predicted, yet in retrospect, they seemed obvious–a great sign of useful new insight. The abilities you have within your natural area of strength do not translate to other areas; you have to stay focused. Example: Michael Jordan’s foray into baseball. Example: Malcolm Gladwell is a great essayist, but all his books are simply a collection of essay-length pieces. It’s easy to forget your strengths. 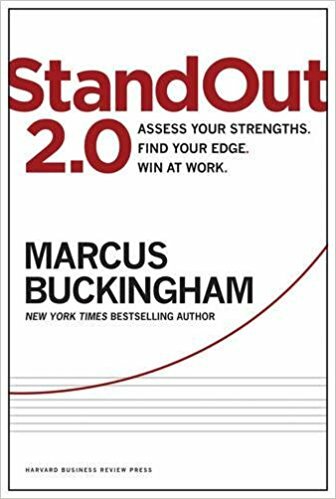 That’s why StandOut focuses on just two strengths per person. Remember your two strengths, and figure out how to channel them. Every day. The most successful people stretch beyond their comfort zone, but do so within their strengths zone. Marcus offers a number of exercises to help hone this practice. Draw a line down a sheet of paper and label one side “Loved It” and the other “Loathed It.” Carry that paper around for a week and write down all the activities that fell into those categories.